Created by David Milch, who won Emmys for his work on NYPD Blue, the HBO TV series Deadwood presents a fictionalized account of the transformation of its namesake from camp to city in the Dakota Territory. Over the course of three 12-episode seasons, which aired from 2004 to 2006, viewers bare witness to about a year (mid-1876 to mid-1877) in the hard and at times deadly lives of fascinating characters, many of whom are based on real people. In the pilot episode, Montana Marshal Seth Bullock (Timothy Olyphant) turns in his star and heads off to Deadwood with partner Sol Star (John Hawkes) to start a hardware business in the gold-mining camp. Al Swearingen (Ian McShane) is the owner of Gem Saloon, which also serves as a brothel. He is the self-appointed boss of the area, ruthlessly ruling with the aide of underlings like Dan Dority (W. Earl Brown). At least until prospector George Hearst (Gerald McRaney) comes to town towards the end of Season Two and flexes his muscle. Wild Bill Hickock (Keith Carradine) might be the most famous notable historical figure to come to Deadwood. He arrives with his compatriots, Charlie Utter (Dayton Callie) and Calamity Jane (Robin Weigert). As history notes, he would be murdered there in Tom Nuttall's (Leon Rippy) #10 Saloon during a poker game. E. B. Farnum (William Sanderson) runs The Grand Central Hotel when the series starts. He is a weasely fellow, seemingly always underfoot around the big players as they make their moves. Newspaper editor A. W. Merrick (Jeffrey Jones) covers those moves and many times Doc Cochran (Brad Dourif) has to clean up after them. The Bella Union was a real establishment, a rival to Swearingen's place though more upscale, but is given a fictional owner in the form of Cy Tolliver (Powers Boothe). It's not clear whom a number of the female characters are based on and are likely an amalgamation. Alma Garret's (Molly Parker) gold-seeking husband has brought her to Deadwood. Prostitution is one of the few jobs available to women. Trixie (Paula Malcomson) works for Swearingen, and is quite a handful as she can be just as violent and deadly as the men. Joanie Stubbs (Kim Dickens) comes to town with Tolliver and then opens up her own brothel. Over the three seasons, there are a lot of shifting alliances between the characters, particularly as different outside forces try to exert control. The second season finds the women's roles expanded as they become more involved in the action and activities of Deadwood. Although violent and filled with foul language, this gritty Western is a brilliantly executed drama brought to life by a talented cast and crew. When a fourth season didn’t materialize, there was hope a couple of TV movies would wrap up the story, but that has yet to happen. The video is presented with a mostly impressive 1080p/MpEG-4 AVC encoded transfer displayed at 1.78:1. The color palette is mostly earth tones, which are brought forth in rich hues, and occasional bits of vibrancy when brighter colors are chosen. Details are strongly rendered, from the buildings to the clothing, and those textures help bring the world to life. Blacks are deep, but crush on occasion. Objects looks sharp and well defined, though there are occasions of softness. There are also brief instances of noise, usually during night shots. The audio comes in a DTS-HD Master Audio 5.1 track, capably handles the series' sound design. It tends to be slightly front heavy, which is as expected for a TV series. Dialogue is clear and understandable and balances well with the music and effects. Surrounds offer ambiance in both quiet and raucous scenes. The subwoofer delivers strong bottom ends, particularly the gunplay. Sounds, like people walking across the room, move through channels and help create space. There are 17 commentaries on 14 episodes, ranging from being very informative to very entertaining. Milch covers three episodes including the series premiere and finale. Executive producer Gregg Feinberg appears solo on "Complications (Formerly "Difficulties")", which he directed and with executive producer Mark Tinker on "Tell Your God to Ready for Blood." The actors are matched up in various combinations and have a lot of fun together, except for Weigert who goes it alone on "Amateur Night." McShane and Olyphant are together for two different commentaries and offer more silliness than insight, which works just fine. The Season One extras on Disc Four are "Making Deadwood: The Show Behind the Show" (HD, 14 min) where the cast and crew talk about the show's historical accuracy as well as its creation, "The Real Deadwood" (HD, 26 min) offers a history lesson from its interview subjects, and David Milch and actor Keith Carradine have conversations about "The New Language of the Old West" (HD, 30 min) and the blending of fact and fiction in "An Imaginative Reality" (HD, 28 min). The Season Two extras on Disc Eight are "The Real Deadwood: 1877" (HD, 21 min), a sequel to the previous feature, focusing on the real-life events depicted during this season, and "Deadwood Daguerreotypes" (HD), a photo gallery containing shots from the real Deadwood and Milch's creation. "Making of Season Two Finale: 'Boy-The-Earth-Talks-To'" (HD, 71 min) is divided into three parts. The cast talks about working with Milch and his colorful dialogue in "Trusting the Process". "Mr. Wu Proves Out" covers the Chinatown alley subplot and its implications. "The Wedding Celebration" reveals the shooting of this sequence. The Season Three extras on Disc Twelve are "Deadwood Matures" (HD, 20 min), where the historians gather again, this time to discuss the events of the third season; "The Education of Swearengen and Bullock" (HD, 20 min) finds cast and crew discussing the relationship between the series two major characters; and "Deadwood Daguerreotypes" (HD) presents more Deadwood photos. Disc Thirteen rounds out the extras and the set. "The Meaning of Endings" (HD, 23 min) finds Milch wandering around the empty set before it was torn down. He is disappointed about the show's cancellation, but understand the realities of the business and feels lucky enough it ran as long as it did. He talks about what he had planned for the future, but is fine with it ending where it did. "The Real Deadwood: Out of the Ashes" (HD, 29 min) provides a finale in a way as it reveals the progression of the town. The "Q&A with Cast and Creative Team" (SD, 64 min) is taken from the 2005 William S. Paley Television Festival, which honors television shows past and present. Cast and crew offer a tour of the set in "Deadwood 360° Tour" (HD, 8 min). "Al Swearengen Audition Reel" (HD, 10 min) stars actor Titus Welliver (Silas Adams) doing a one-man bit as he impersonates Milch auditioning Al Pacino, Christopher Walken, Robert Duvall, and Robert De Niro for the role of Al Swearengen. 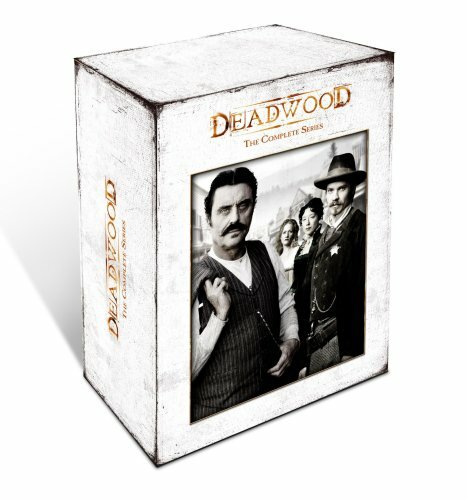 Deadwood is a compelling drama brought to life by a talented cast and crew under the guidance of David Milch. The Complete Series on Blu-ray delivers a very good presentation, filled with extras for those who want to learn more about the series and history it is based on. This is a show that I definitely want to go back and watch end-to-end, and blu-ray sounds like great way to do it ! Milch if I may posit is a character more than a plot guy, and Deadwood produced some amazingly memorable ones (along with dialog that stands truly unique in the annals of television). I'd definitely love to check out the commentaries with Olyphant and McShane -- they sound like a lot of fun. And we need McShane back on TV -- that Kings show on NBC was actually quite promising but didn't gain much traction. Another great showcase for McShane's chops though.